So, it's been a long while. It seems that we are currently in a midst of a period when there are so many different things ongoing simultaneously that in the end it seems extremely difficult to find the appropriate time for...well, basically anything. But better late than never - now we are back and quite exited to share with you our experiences on how to construct an acoustic slat wall! For the last two moths, as boring and slow it might sound, Pekka has been sanding and oiling teak slats made of material sourced from Tiikki.com. The bunker has proven to be an absolute necessity allowing the isolation of this kind of smelly and dusty work, which when for example left to dry does not conflict with everyday life. To date, nearly half of the wall is ready, the other half waiting to be finished before the first week of December when the electrical work including the indirect lighting of the slat wall will be finished. 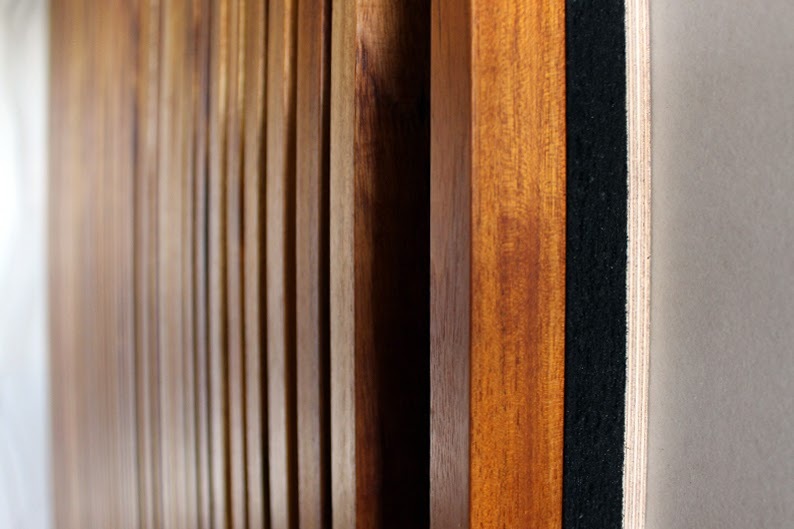 We also needed close to 15 square meters of acoustic panels for the slat wall, and as a result of some research work, found an excellent material provider option from Finland: Konto. 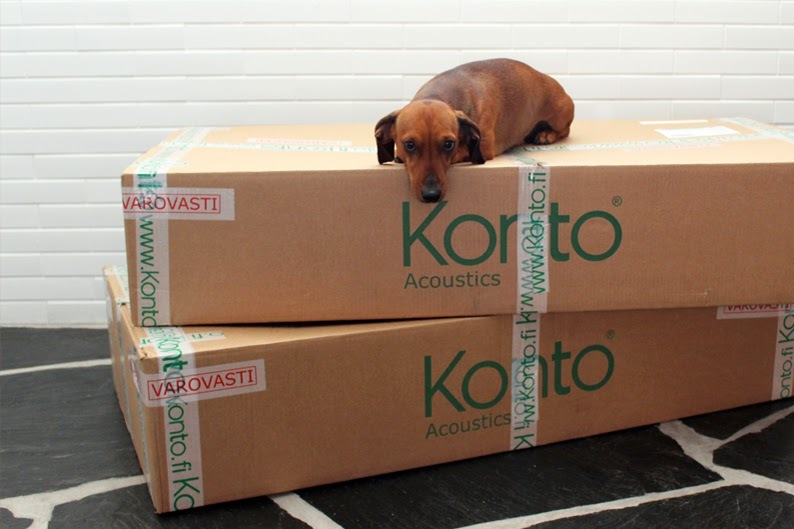 Especially here in Finland Konto is recognized for its innovative acoustic products made mainly of peat moss. Specifically, we would like to thank Sami Laitila from the Konto Team for is expertise and kind customer service. If you have any needs regarding acoustic panels, do not hesitate to contact Sami! There are several reasons why we ended up choosing Konto. First, we preferred a Finnish product with solid acoustic capabilities minimizing the echo created by the slate floor. Second, the Konto panel works exceptionally well in the slat wall sandwich structure Pekka created. The panels are rigid enough not to squeeze together too much, and they have a tough outer surface that will not break easily. Third, as the panels are mainly made of peat moss it is a sustainable product matching our renovation philosophy. Konto acoustic panels are also very easy to resize with a stanley knife. Afterwards, a cut panel edge can be "re-closed" with heat for example using a flat iron. After this, the edge can be painted, leaving no visible cues of previous modifications. Pekka needed to do some detailed cutting for a vent that is located at the top part of the wall. He also sliced a very thin, round piece of the panel in order to clue it on the top of the vent lid. This enables unification of the surface texture with the rest of the wall. Now the only missing part is a slat hatch. Other important piece what was needed for the wall is a ten meter LED stripe, which will be a light source for an indirect wall light. 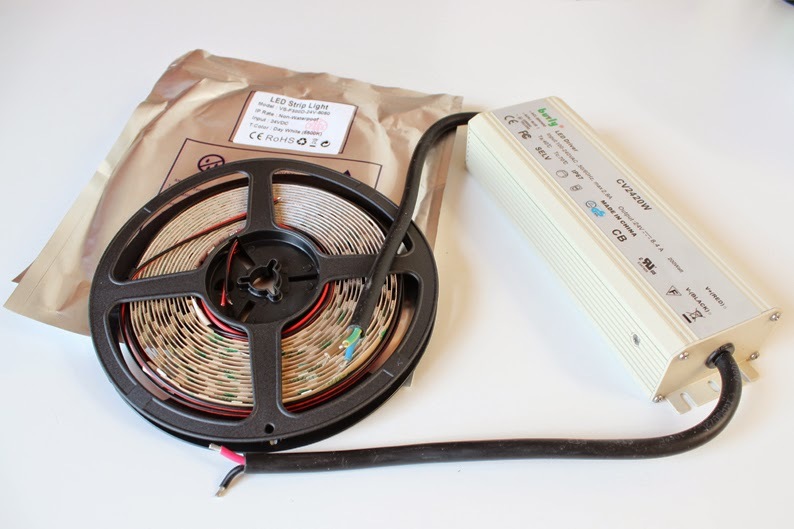 We found the components from Adlux (highly recommended material provider). There were two important considerations. First, these LEDs provide a light with a color temperature of 5500K, which is very close to the day light color temperature. This kind of lighting conditions compliment the surrounding colors in the best possible way. Second, these LEDs can be dimmed, which we considered very important to be able to adjust the amount of light to match the different uses of the space. Next to the construction of the slat wall. 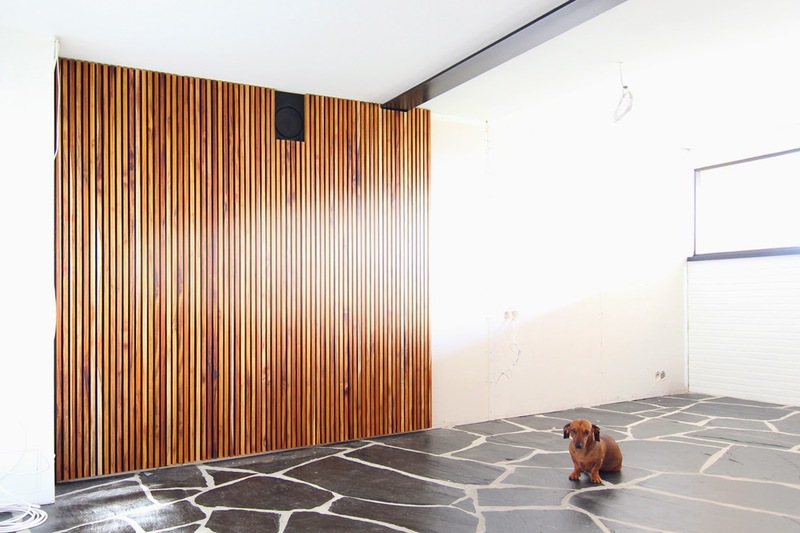 First, an acoustic panels is "squeezed" between teak slats (in front) and a board of plywood (on the back), creating a sandwich structure. All these three elements are then attached together with screws from behind. The wall itself is also modular. The width of each module was determined by the width of Konto panels (594 mm). Pekka started building the modules with a sheet of plywood and then adding an acoustic panel on top. Then he placed the teak slats prepared with love and patience on top of the plywood-panel base. The idea was to have a fixed space between each slat leaving the black acoustic panel partly visible on the back. This was achieved by using pieces of wood as spacers allowing Pekka to control the gaps between slats while completing the screwing phase. Pekka had also pre-clued stripes of printed paper to the back of each plywood element. These stripes helped to determine the screw marks with precision allowing easy assembling. Once each module was completed, the next step was to attach it up on the wall with screws. Leaving an empty slat space to each end of the module enabled fixing the modules with screws from front up to the wall. Later, single slats will be glued to cover the empty spaces, hiding the screw heads and creating an illusion of a perfectly screwless entity. On the very bottom we left a small space between the slats and the slate floor, which determined by the choice of material is a bit uneven. This appeals to us visually, as the slight unevenness is not so noticeable, but it also has a functional aspect. We will be using the space to hide electrical wires etc. behind a black hatch made of Konto material. Once again, even if it is an extremely slow process where counting the working hours makes absolutely no sense, we are really happy to see how the finished half of the slat wall looks, and can't wait to share the rest of the story with you! Kiitos! Joo onhan tossa ihan älytön homma, varsinkin kun luonto ei anna periksi olla laittamatta kuutta kerrosta kiinanpuuöljyä jokaiseen 200 keppiin ja hioa ne aina välissä teräsvillalla:) Seinän tulee kruunaamaan siihen ajettu epäsuora valo, joka tulee herättämää öljytyn tiikin syvään ja lämpimään hehkuun. Näillä näkymin seinän pitäisi olla valmis joulukuun alussa! Wow! Can you come over and do some mid-century modern reno for me too please!! Oh wow! I've always wanted an acoustic wall at our house. Coming from a family who loves musical pursuits in all its kinds, that wall would just be the perfect addition on our home. Now I'll definitely follow that DIY feat and renovate our own music room. Thank you so much for sharing that! I hope all your other projects be as equally successful. Hi Justin! Thank you so much for getting back to us. It gives us great pleasure to hear that something we have done in our home gives inspiration to someone on the other side of the world. Hope that you keep in contact and tell us how your renovation proceeds! Also please stay tuned for the rest of our slat wall updates as things are proceeding quite well behind the seen and we will release an other update quite soon! Where do you intend to attach the LED strip ? Across the top ? Bottom ? Yes, across the top, pointing downwards and then covering the source of light (LED strips) from the front in order not to show the source of light. For the sake of the end result it is crucial to place the strips in a correct distance both from the slats (horizontally) and from the ceiling (vertically). If the strip is placed too close to the slats the light won't shine down enough and if the strips hang to low in relation to the front cover the LEDs are exposed to the bare eye. An other challenge might be the reflection of the LED's from the oiled wood. This can be solved by covering the strips with semi transparent plastic. We'll see.. We might have to try a few times to have everything as we want, but I can't wait to see the end results as the light up, oiled teak will look fantastic! A couple with two young children and a dachshund from Espoo, Finland. We have a passion for mid century modern architecture and design, and are on a continuous journey of renovating a 1960's dream home. You are warmly welcomed to read about our endeavours and also to share your thoughts and ideas!